Curious Art Lab: Sleep Tight! I did the initial sketch in ink & white gouache on toned paper, then changed the color & added the background (scanned from an acrylic painting) in Photoshop. Part of me really really wants to refine this, but I'm trying as hard as I can to let go of my obsessive tweaking since I know I won't have time for that in my class. 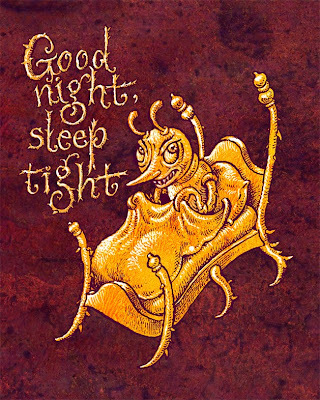 I do hope this creepy crawly fellow doesn't disturb your dreams. Looks pretty good to me the way it is! Great illustration! He will disturb my dreams but I like it and your style. I can't believe I didn't even think of bedbugs!!! Great idea! Genius! And, again, your bedbug=great(and clever)! Bed bug aaah! He's scary in a cute kind of way. The idea of bed bugs is creepy and I hear they're difficult to get rid of. Love the legs on the bed. Good luck with your class!